All those candidates who participated in IBPS Clerical cadre recruitment Examination CWE are informed that IBPS today declared the written examination results for clerk Posts. All participant can check there results from the official website of IBPS Results SifyTest. If you enter DATE in different format it will show error. 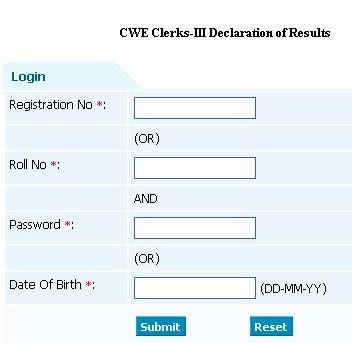 In case it showing Invalid login then try use correct password which was send by IBPS during the registration process. For any other help you can posts your comment here. IBPS will Send Detailed Score Card in you email ID after 10 days from the date of results declaration. So wait 10 to 15 for IBPS Clerk Score card and Cutoff marks.